Winters on Anglesey can be harsh. Were it not for these exceptionally clear blue days then I really would suffer. But this Saturday has filled in the existential void for a short while and presented me with a memory of brilliant hues. This will act as a spiritual laundromat through which I can filter inevitable tedium. I also know that similar days will occur again. February can throw up sunshine, refreshing blueness and unseasonally warm days. I just hope it doesn't happen during the week when I'm trapped in an office staring out of the window. The image above was taken from Gallows Point revealing Beaumaris in profile. On the far left is St Mary's Church in the background. In front the gentle pastels of well-cared for Victorian homes gathers you into town. The white building to the left of the pier is the Blue Peter Beaumaris Lifeboat Station and you'll find a large rectangular paddling pool on the town side. On the other side is the launching jetty used by the Royal Anglesey Yacht Club. All of which hangs suspended in bright sky and reflected Winter blueness. 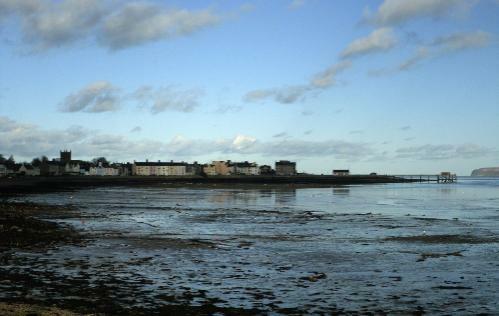 Quite clearly, the tide is out and I must admit the mud flats looked seriously interesting. 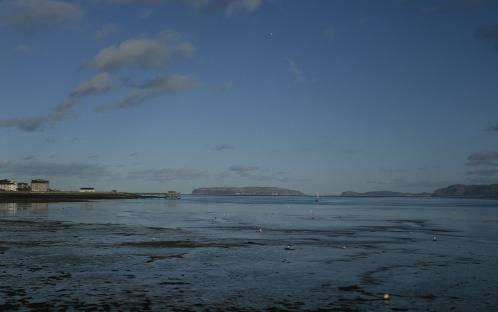 In the centre of this image is the Great Orme. At the base of which (to its right) is Llandudno. I don't want to direct you away from Anglesey and the Menai Straits, but the drive around the Orme offers astounding views of the Island. That is the Truth. Look to the Pier's end and you will note that even when the tide is out you can still land your swag. 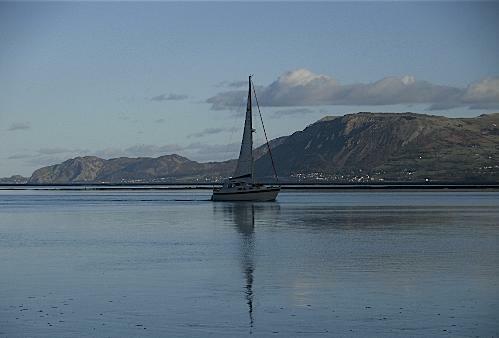 The Menai Strait's Centre Channel sweeps in close to the town, hence Beaumaris' popularity with conquering hordes down the ages. See my Beaumaris Castle Page for more information on this. 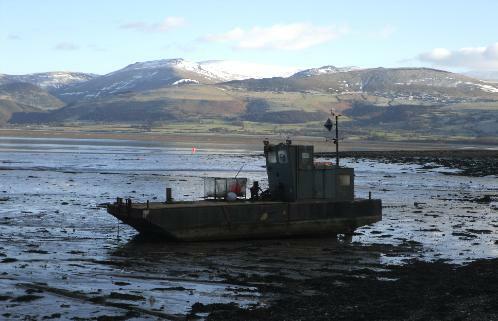 It is easy to land here and once upon a time you could dock your 40 ton ship right by Beaumaris Castle's South Entrance. OH, YES, please notice that yacht coming down the Straits. It was a very calm day and I wandered where the puff was coming from. Intrigued, I moved further to the head of Gallows Point to get as close as possible to where it must inevitably pass by. To remind you that the weather had been decidedly wintry across this weekend, have a look at the Carneddau Mountains of Snowdonia. It was still a cold day with a light north easterly wind undermining any illusions that it might be an early Spring. Behind me as I took this photograph I could hear the banging and tinkling of keen navigators repairing their craft. All craft are removed from their moorings and gather together in a spiky congregation on Gallows Point. The craft above places and removes Summer moorings. I understand that marine insurance only covers coastal yachts for about nine months of the year. It's all quite sensible of the insurance companies. Fierce north easterly storms maliciously gather elsewhere to fall savagely on the Anglesey coast. Have you heard about the 'Royal Charter'? The 'Hindlea'? Have a look at my MOELFRE page for more on these famous shipwrecks. I adore this picture and the vertical version below. 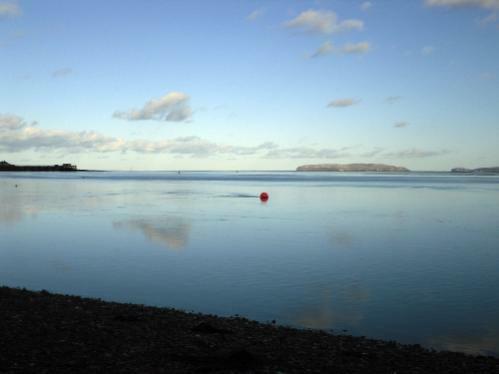 There's not much I wish to say regarding these two visions of the Menai Straits. Maybe just one thing. What I love about Anglesey is the vastness of the sky and sea together. Together these images entice and entrap with their rare Winter beauty. 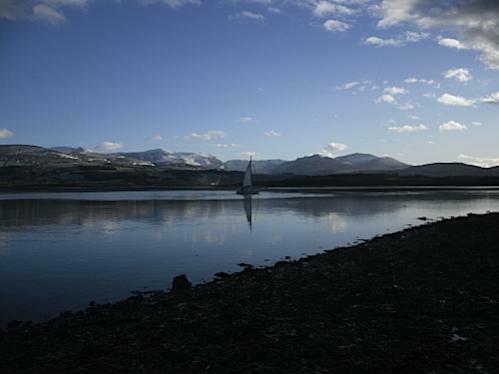 Do you have a tale to share about your stay in Beaumaris or sailing down the Menai Staits? I'm sure we'd all be delighted to hear from YOU. Feel free to share your stories and if you have any photographs please let us see them. Now forget about all those irritating concerns that cause you those little spiritual tremors in your tummy. Relax a bit and think about a glorious sunshine blue day you recently experienced. The psychologist in me proposes that if you cannot remember such a day then make one up. Your brain's positive chemicals respond to emotions so create a good self-enhancing image. A positive vibe nails a lovely memory, which can be called into central focus on demand as a remedy for a passing sadness. Taken from about halfway to the head of Gallows Point this image really shows you how narrow the Straits become at Low Tide. 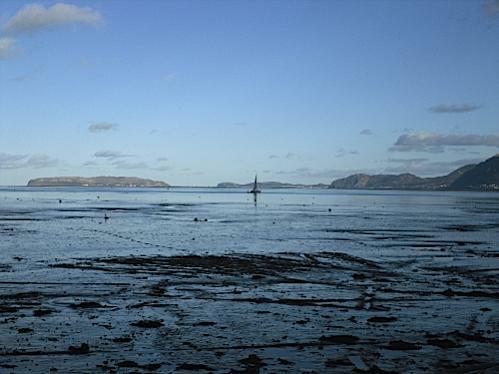 The Centre Channel sweeps around Gallows Point and then heads straight for Beaumaris Pier. 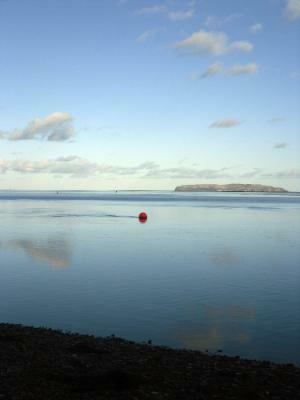 Scroll back up to the photgraph of the Mooring Boat and behind it you will see the Red Buoy and the sandbanks just beyond. Travelling down the Menai Straits in this direction for boat safety you keep the Red Buoy on your left. Conversely, you should keep the Green Buoy on your right. The Salty Seadog saying goes: There's no RED PORT LEFT in the bottle." When you reach Caernarfon you'll notice a yellow buoy opposite where the River Seiont issues forth into the Straits. On it are two cones pointing toward each other. This signals a reversal of navigation buoy protocol. Heading around Abermenai Point for Llanddwyn and Llanddwyn Island, you keep the Red Buoy on your right, Green on your left. That which was distant is no longer so. The quiet Put Put! of the engine perturbs the illusion I'd harboured for a while. The power that impells it forward is man-made, not mysterious. Yet, it sails majestically past inevitably intent on its mission down the Menai Straits. Maybe it came from St Seiriol's Celtic Island Resting Place. I know nothing of the owners of the Passing Cloud. I wished they'd waved back, though. I don't think I look like an international maritime terrorist. At least, it's not something my Mother ever mentioned. Finally, she spreads her wings and the mystical illusion is revived as Elron bears wounded Frodo and Gandalf away. I am Sam Gamgee, left behind on a cold muddy bank on the Menai Straits to imagine what adventures lies ahead of this winged ship. I rest there a moment, lost and saddened until I remember that a piece of delicious quiche and cuppa are waiting for me in Sarah's Coffee House back in old Beaumaris Town. At least bloody wave next time!" While you’re in the Menai Bridge area why don’t you indulge yourself with delightful walks along the banks of the Menai Straits. I have created a page with a walk that you can complete in one endeavour or break it down into a few stage to suit your mood and time. When I was writing about Llanddwyn Beach on the West Coast of Anglesey, it was fun sharing my Fish Batting story. I'm sure you've got some even better Anglesey holiday stories that people really would love to hear about. Go on, let us hear them. 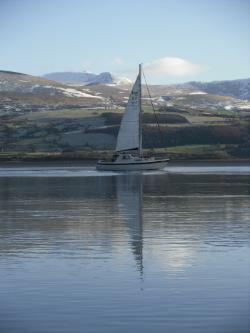 Return from Menai Straits to BEAUMARIS TOWN PAGE. Visit PENMON & PUFFIN ISLAND Page.